Radiating peace and tranquility, Stella Beach House is a beachfront villa that places you at only 10km from Mauritius’ SSR International Airport. Because it is only 300 meters from the main bus stop, this villa also enables you to make the most out of the nearby amenities and entertainment. Facing the lagoon, Stella Beach House is also perfect for couples or families who want to enjoy as much sun, sand and sea as they want during their stay in Mauritius. Stella Beach house boasts three bedrooms on the first floor that can very comfortably sleep up to six people. The wide master bedroom features spectacular views of the ocean, enabling you to wake up to the splendid sight of the golden sun rising above the waves. In the master bedroom, you’ll also a king-sized bed, en-suite bathroom with dual sinks, toilet and shower as well as a spacious wardrobe. The two guest bedrooms are composed of an en-suite bathrooms as well. One of the guest bedrooms is equipped with a double bed, while the other features twin beds. The villa doesn’t come with a swimming pool, but with the glistening turquoise ocean right on your doorstep, you’ll be able to enjoy a refreshing dip as often as you want. Stella Beach House boasts a small garden, and you’ll also find sun loungers where you can simply lie back and relax with your favorite drink and book. Additionally, guests of Stella Beach House can also make the most out of the airy wraparound porch which comes with a table and chairs that can seat six people, ideal for Al Fresco dinners with your friends and family. Outside, you will also find barbecue equipment and facilities which you can use when you feel like enjoying the balmy tropical evenings. In the living room, you’ll find plenty to keep you entertained during those lazy days in. 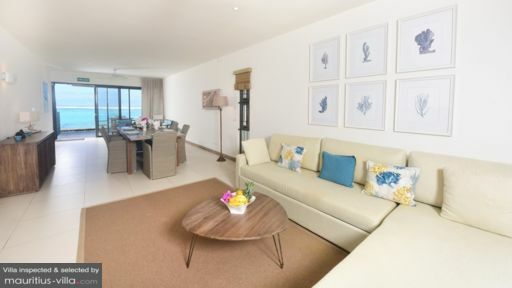 With free Wi-Fi that runs through the entire unit, Stella Beach House features a large and airy living room that overlooks the ocean. It is also perfectly equipped with a DVD player as well as a flat-screen with satellite channels. 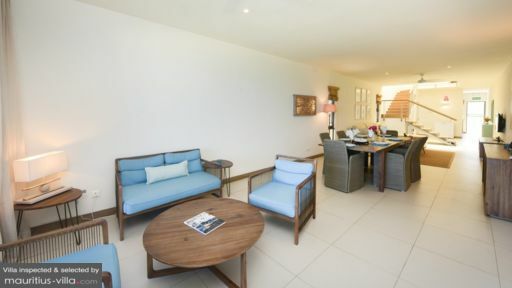 The dining area is fitted with large windows to let in plenty of that warm Mauritian sunshine. Furnished to accommodate up to six guests, the dining area features a contemporary decor that reflect the typical Mauritian warmth. Because this villa is self-catering, guests will be able to benefit from various types of appliances and equipment to help them effortlessly whip up their own meals in the ktichen. Indeed, the kitchen includes various utensils, electric kettles, toaster, a coffee maker and Nespresso, dishwasher, hotplates, oven, microwaves and the likes. 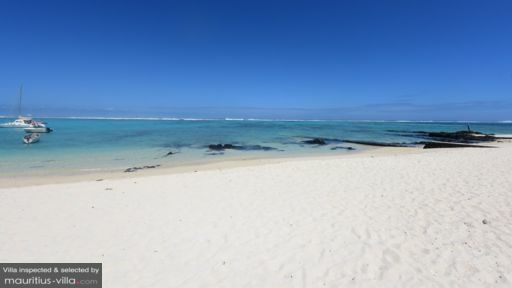 Various services are included to render your holiday in Mauritius even more pleasant. A housekeeper will show up daily to clean and maintain the premises for free, except on public holidays and Sundays. For an added fee, you can rent extra services such as taxis, ironing services, an in-house chef, in-house massage as well as different types of activities and excursions. Not far from the villa is the picturesque fishing village of Mahebourg, where you will find different attractions that you can explore. The Waterfront, for example, is a magnificent place to relax as you enjoy a fresh tropical fruit salad. In Mahebourg, you’ll also find different types of craft, food and clothes markets.